Our most versatile and adjustable stylus allows you to position it in just about any position. 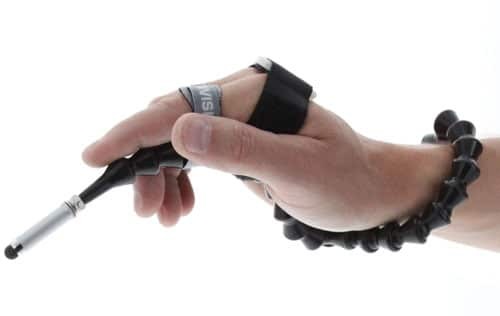 Our most versatile and adjustable stylus allows you to position it in just about any position – between fingers, above your hand, under your hand, around your wrist. Whatever works best for you! Comes with two adjustable Velcro straps for stabilizing and securing the stylus. A You can pop off links starting from the back of the Stylus at the T-connector. Do not try and remove them stating from the Stylus tip. Inside the plastic tubing is a metal wire that runs though the length of the stylus, this is needed to give the stylus it capacitive touch function without the wire it will not work. 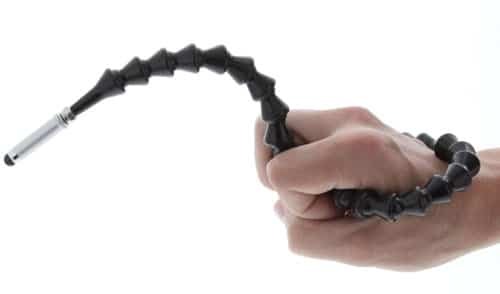 You can pop off the plastic tubing by hand, dont cut the wire fold it back and snake it back into the tubing in case you ever wan to add back the length to the tubing. Replacing the tubing will require some force to snap them back in place. There is also a tool that can be purchased contact us at customer_support@enablingdevices.com to find out where to buy a tool if needed. Q Does the stylus just screw on the end? 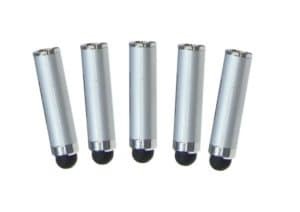 A Yes the stylus tips screw on and are replaceable, sold in a set of of 5 item No.9091 as show on the product page under the accessories tab. Q Does this stylus come with tips? If so, how many? A Yes it comes with one replaceable tip and you can order more in a set of : Item # 9091. Q Is the stylus telescoping so it can be shorter or longer? A No, but you can remove some sections of the tubing to shorten the length. Q Will this fit a 7 yr old child? A It should work and you can remove some of the links if needed. Q I assume this is capacitive stylus as it's under ipad accessories. Is this correct? A Yes that is correct.